While pregnant with Zoei, Tonya found out that she had an incompetent cervix – weak cervical tissue. As a result, her growing baby caused Tonya’s cervix to open. Then Tonya began having contractions at less than 21 weeks’ gestation. 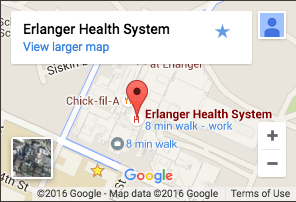 She was admitted to Erlanger, where a team of physicians determined the best course of action. “I was scared to death, but I knew God had promised me this precious little girl. So whatever the doctors needed to do to make sure Zoei was good, I was fine with it,” Tonya recalls. At 22 weeks, the baby was in distress. So the doctor on duty performed an ultrasound which revealed that the umbilical cord was wrapped around the baby, and her foot was at the opening of the cervix. The doctor could actually feel the baby’s foot upon examination. Tonya’s doctor was en route to the hospital through a snowstorm. And while the physicians on duty conferred, Zoei kicked through her amniotic sac. At this point, the nurse on duty shouted, “Foot out! Move!” Medical teams came from everywhere. Tonya was told to push and her baby girl was delivered quickly. The doctor cut the cord and handed her off to the NICU team in seconds. Meanwhile, Tonya needed help. She had a placenta abruption and her cervix was collapsing. She lost a lot of blood and had to have emergency surgery. As Tonya recovered, she had no idea of the long journey ahead. Zoei was born at 22 weeks, breeched and weighing only 1 lb. 3oz. Tonya was told it was unlikely that Zoei would survive. Even so, she remained confident that the baby would be fine. Zoei stayed in NICU for 124 days. The only surgery she needed during that time was a PDA ligation, correcting a heart defect. The baby didn’t have any brain bleeds, heart murmurs, or any of the major complications most “preemies” have. Zoei came home without supplemental oxygen or heart monitors. The only surgery she’s had to have since has been a hernia repair, which was successful.